Our favorite online fashion publication Refinery29 featured the Leather Choker in Light Natural, and the Esses Cuff in sterling silver in a recent Short Cuts video! Check out the sweet smokey eye tutorial, and a chance to buy both products below. Thanks to the tight team at Refinery for a fun day shooting (talk about an all girl call sheet, major #girlboss moment!) and the chance to share our product with your readers. It was an absolute pleasure to partner up with Young & Able during the holiday season. Y&A curates a roster of designers and makers and shares their innovation with the world. This year, their focus was women-owned, Brooklyn-based businesses, and I was one of thirty! The month of December was jam-packed with holiday sales and events. 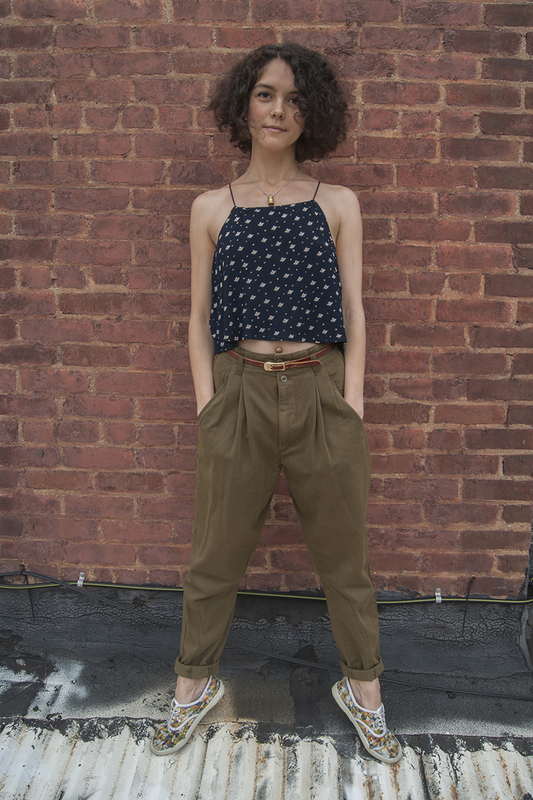 As part of Young & Able, I featured my line in their Pop-Up Shop on Rivington (right next to Morganstern's! Yum!) and continue to be featured in their online store. Shop Young & Able here. We had such fun collaborating that we even made this short video together. Thanks to Emily 'Skeletal' Erhart for filming while we make Geo Bangles, and talk about hustle, heart, and doing what you love. Looking forward to another productive year of growth and prosperity! Stay tuned for more collaborations and other exciting developments. Marriage of metal involves combining different metals to create a seamless, multicolored design. This technique is a personal favorite of mine, and it was a pleasure working with such nice material for such a special occasion. My Gowanus studio is the main workshop for all of my designs, and the birthplace of all new ideas. For the past three years, I have used this space to fulfill orders, design new pieces, and experiment with my favorite material: metal. Take a peek into my workspace and enjoy this video made by my friend John Rosati. We spent an afternoon talking about creative work and business, all while toiling away at the bench. Please visit John's vimeo page to see the wide breadth of his talent: https://vimeo.com/johnrosati ...and stay tuned for new summer pieces and exciting updates, coming out of Brooklyn, NY! The Flex Ring is one of my personal favorites. I designed it in college for a wax-carving and casting class. It was a really early design, and one of my first forays into wax work. When you're exploring a new medium for the first time, naive curiosity takes over, and you give way to a pure and different design. I'm happy to announce that for the first time, the Flex Ring is available in rose gold, exclusively on Scout Mob! 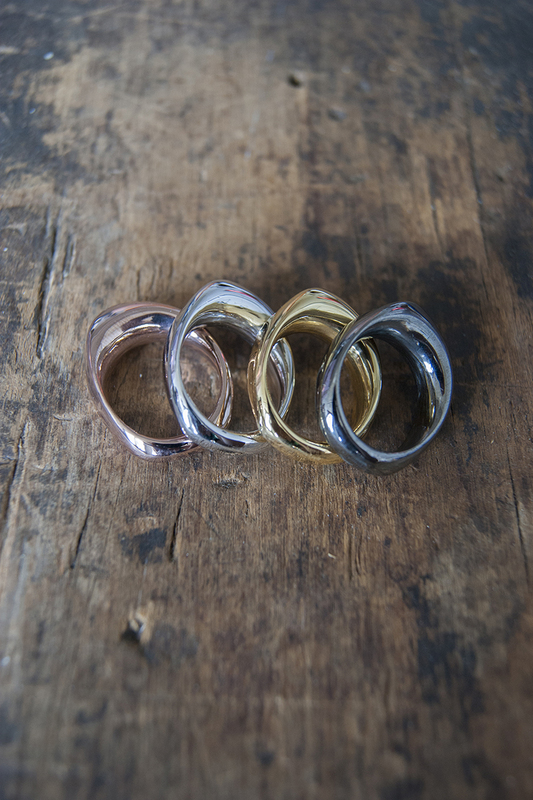 The Flex Ring in rose gold, rhodium, gold, and hematite, available here. After I made all the new goods, my good friend and fellow Pratt alum Francine Grenci came over to my studio one afternoon and we took pictures. We did the typical product shots, but we also documented the space I work in, my bench and tools, all of my peaceful environment that facilitates my design work and production. We even climbed out onto the roof and played supermodel before getting kicked out by the super. Photos from our fun day can all be seen in the Shoppe. Everything in my Scout Mob Shoppe, including Totem Necklaces, Geo Bangles, and Era products, is all available for a special discount. I even updated the Era Bracelet, and it's looking better than ever. Click through any of the pictures or the link below to see! I have lots more exciting stuff in the works, so stay tuned. For now, happy summer and happy shopping! Visit my Scout Mob Shoppe here! An outtake from my fun day with Francine. Click the photo to shop Scout Mob. I was recently asked to participate in Maiden Nation's ImagiNation campaign. This is a platform for female designers from all around the world to share their vision of an ideal nation. I was so thrilled to be chosen among great designers like Chan Luu and Rachel Roy, even Yoko Ono and Gloria Steinem submitted designs for ImagiNation. 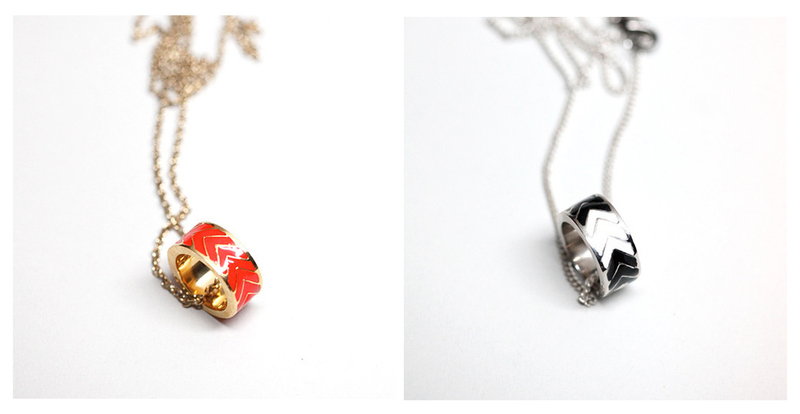 So I transformed my Insignia Rings into necklaces in special colors just for them. We shared our unique visions for an ideal nation on MaidenNation. Gloria Steinem's is my favorite: Imagine we are linked, not ranked. Can you spot me in there? You can also navigate the hashtags #imagination365 and #maidennation on Instagram to see what all the girls are dreaming up. All of the designers and contributors gathered for the launch back in January. We drank sangria and heard stories from organizations like Same Sky, who employ women living with HIV/AIDS in Africa to make beaded jewelry for high wages. To count myself among these types of people is an honor I'm not certain I am worthy of, but the palpable sense female camaraderie was uplifting and lasting. More soon! Happy Women's Day! Check back for updates, Instagrams, markets and other news.